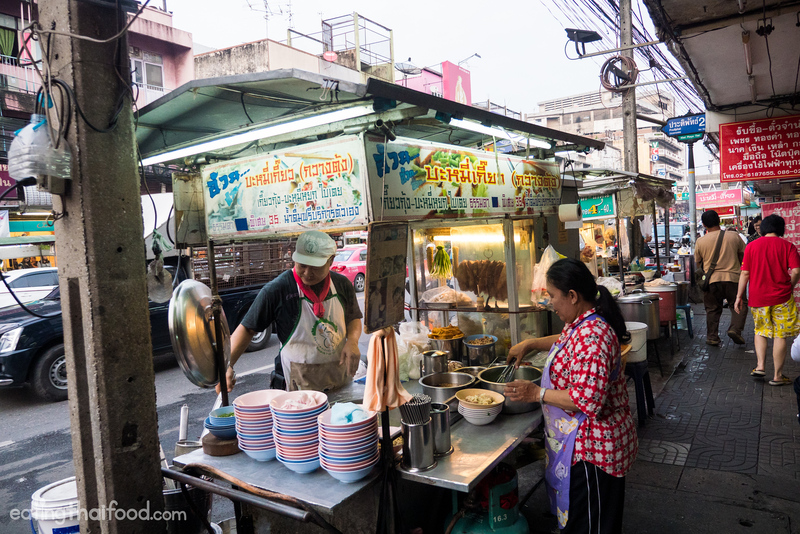 The area around Saphan Kwai is one of the many wonderful street food areas of Bangkok. 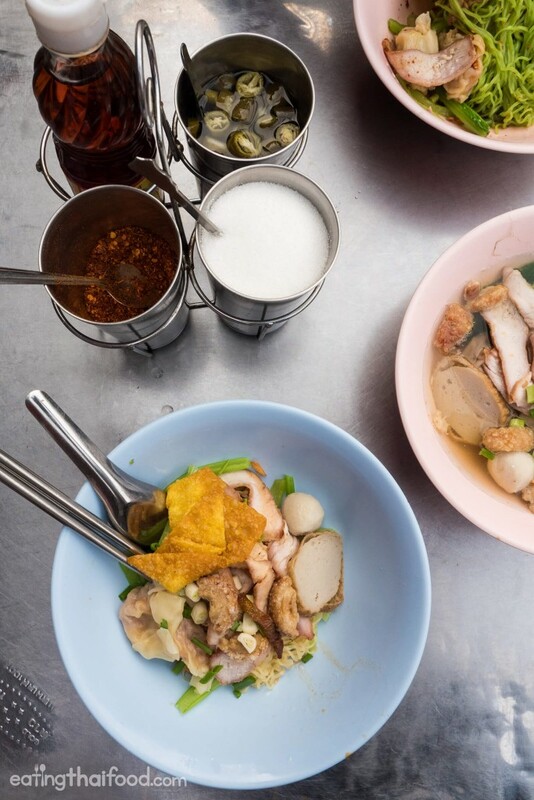 Throughout the morning and day, and especial in the evening, there’s an abundance of street food stalls that set up along the busy Pradipat Road. One evening, right around 5 pm, when all the street food stalls were just rolling out their carts to the side of the road, Ying and I were in the area, and we decided to check out Uan Bamee Giew (อ้วน บะหมี่เกี๊ยว (กวางตุ้ง), a stall serving egg noodles and dumplings. 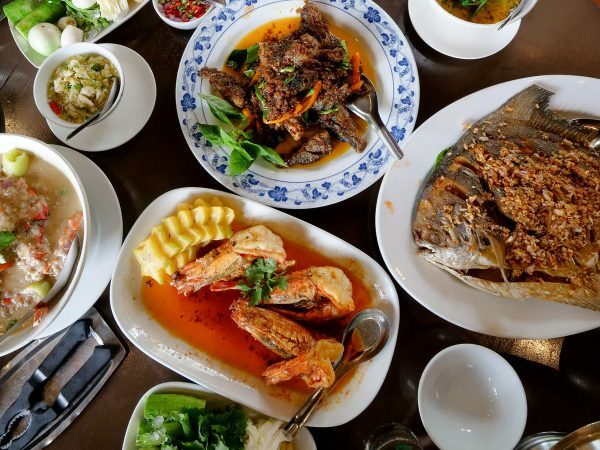 In Thai, uan (อ้วน) means “fat,” – and so just like the legendary kuay jab stall in Yaowarat, it’s likely that the stall was named after someone (the owner or a family member), who was at some point in their life, a little on the chubby side. 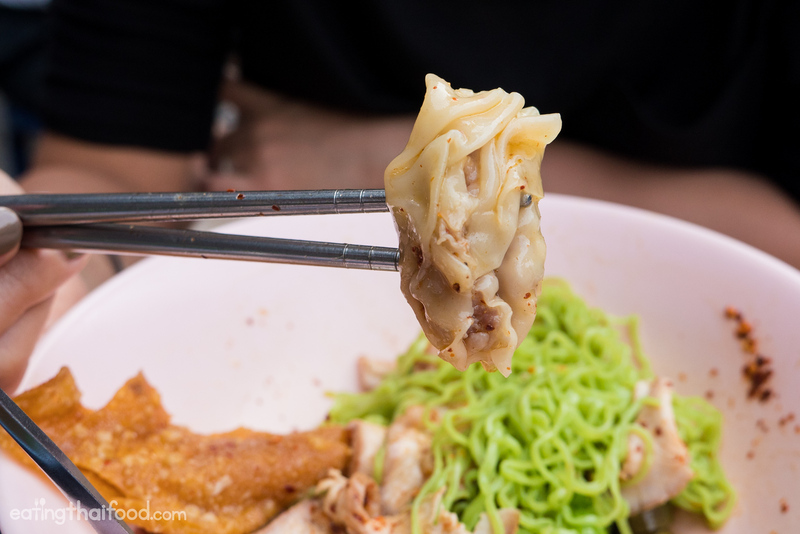 Bamee (บะหมี่) is the word for egg noodles and giew (เกี๊ยว) are won ton like dumplings. Finally on the end of the name of this street food stall they also added Kwangdoong (กวางตุ้ง), which refers to Guangdong province of China. We arrived to Uan Bamee Giew (อ้วน บะหมี่เกี๊ยว (กวางตุ้ง) just a few minutes before 5 pm, and we were the first to grab a table right next to the stall, and we were the first to order! 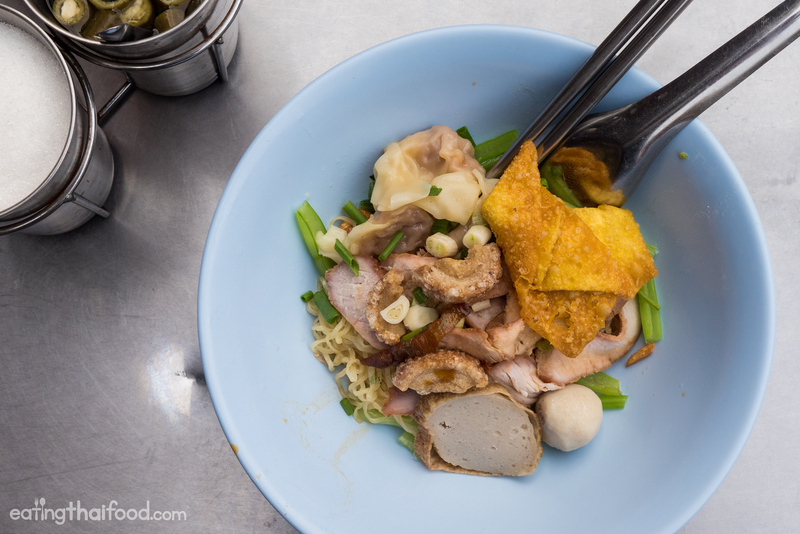 There’s no menu at this street food stall, but you just have a few choices of what to order, mainly their specialty of egg noodles and won ton dumplings or green noodles (more below). I decided to go for bamee giew moo daeng haeng (บะหมี่เกี๊ยวหมูแดงแห้ง), egg noodles with won ton, red pork, and the dry version. Alternatively I could have ordered bamee giew moo daeng nam (บะหมี่เกี๊ยวหมูแดงน้ำ), which would have been the same mixture of ingredients and toppings, but with soup within the bowl, as opposed to soup on the side in a separate bowl. I could tell right away that the owner of the restaurant took pride in his cooking, as he pulled out a handful of freshly prepared egg noodles and tossed them into the boiling water. Along with the egg noodles he added in some of the choy sum, a couple of won ton, slices of red bbq pork, a few slices of fish cake, some crispy pork skins, and just a very light seasoning of deep fried fragrant garlic and oil. The mix was beautiful to say the least, and it came with a bowl of soup on the side with a big pork bone swimming in the middle. I tested out the soup first. It was wonderfully rich and porky, yet not too oily. It was nice and salty, not sweet like it occasionally is in Thailand, and it had perhaps just a very light pepper and green onion touch. 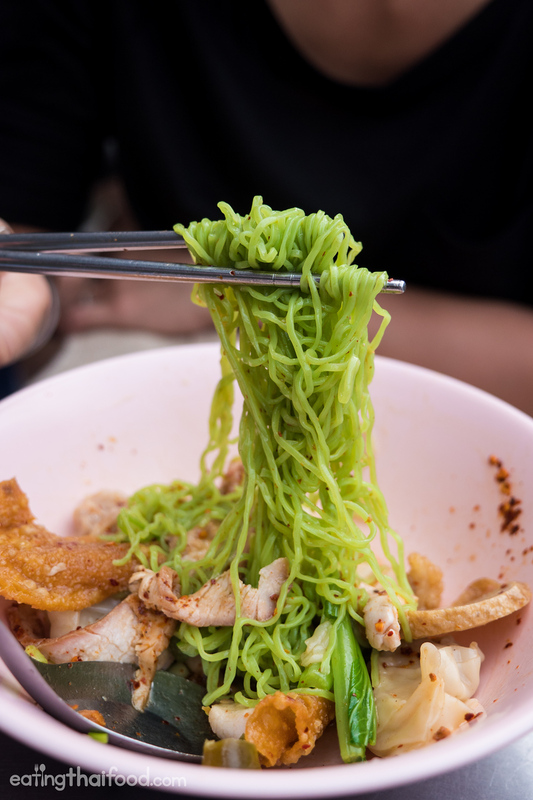 One of the best things about eating street food noodles in Bangkok is getting to season them according to your own taste buds. 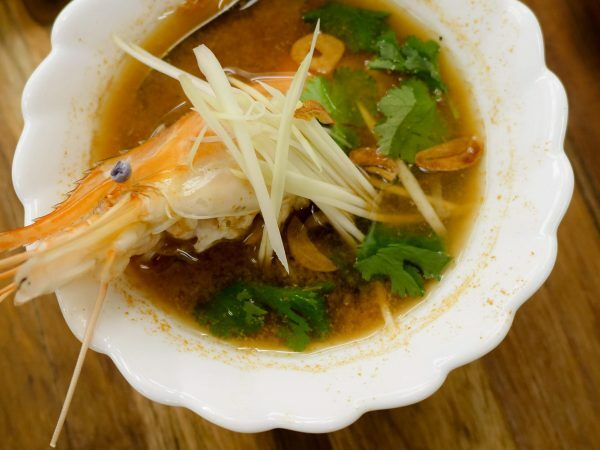 I usually avoid the sugar and extra fish sauce, but load up my bowl of noodles with dry chili flakes and vinegar. The noodles were excellent, and I could immediately tell they were high quality home-made noodles – definitely not the factory type. 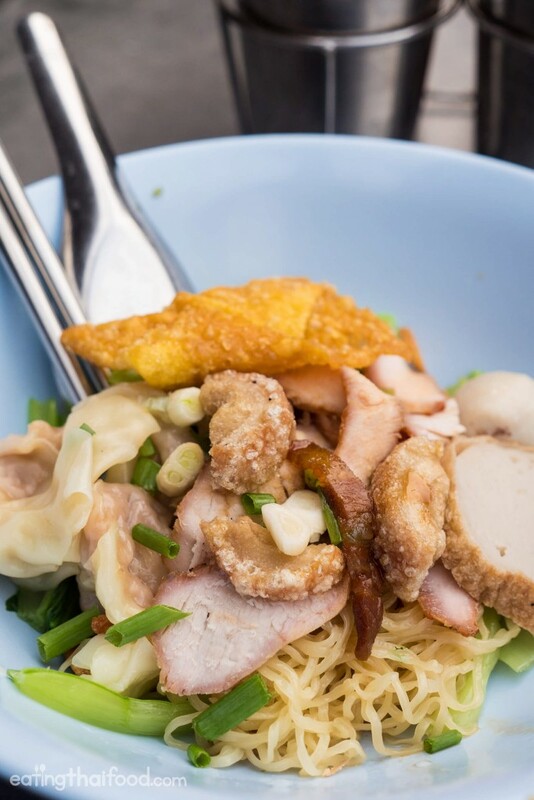 Go to many Bangkok street food stalls that serve bamee giew moo daeng (บะหมี่เกี๊ยวหมูแดง) and you can tell right off the bat they are using factory made noodles. 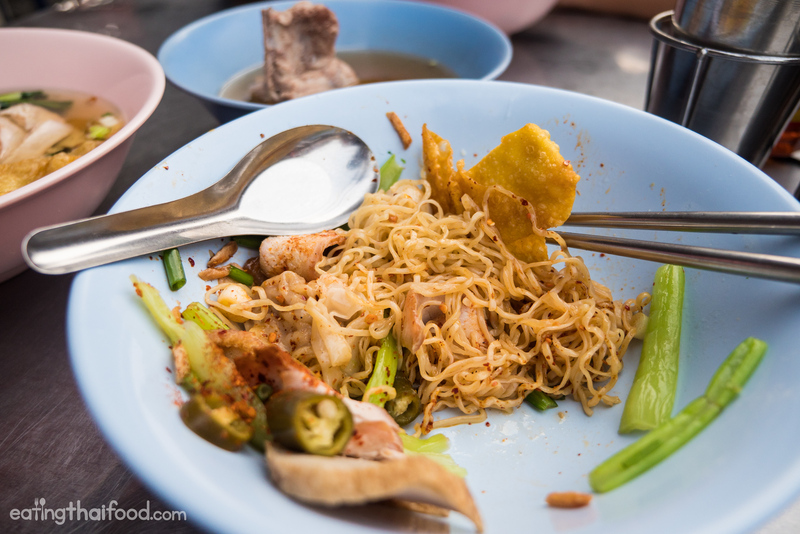 But just after taking my first bite of noodles at Uan Bamee Giew (อ้วน บะหมี่เกี๊ยว (กวางตุ้ง) I could tell the quality of the noodles – and it makes all the difference in the world. In addition to the noodles, the won ton dumplings, which were mostly filled with a mixture of minced pork I believe, were fantastic. They had a nice sesame oil fragrance, and the inside mixture was so soft and tender, it almost completely blended into the noodle wrapper. The toppings were all really good too. The choy sum was nice and fresh, and nearly had a spinach texture, and the slices of red bbq pork (หมูแดง – the Thai version of char siu), was really good. Again, sometimes Thai red pork is way too sweet and has no flavor. But this was excellent and not too sweet. I didn’t include this in the video, because this was what Ying ordered. But another variation of the typical yellow egg noodles is bamee yok (บะหมี่หยก), egg noodles that are prepared with some kind of green vegetable juice (I think kailan or some kind of spinach), to make them green in color. As you can expect, the noodles did have a bit of a greener taste to them, but very similar, and that same wonderful home-made noodle taste and texture. Ying loved her bowl of bamee yok giew moo daeng haeng (บะหมี่หยกเกี๊ยวหมูแดงแห้ง). After finishing off my first bowl of egg noodles, I decided to go for a bowl of giew nam moo daeng nam (เกี๊ยวน้ำหมูแดงน้ำ), just won ton dumplings with all the toppings in soup. Again, I seasoned it with some dry chili flakes and vinegar. The dumpings were awesome, I loved them, and then all the pieces of pork and toppings were good as well. 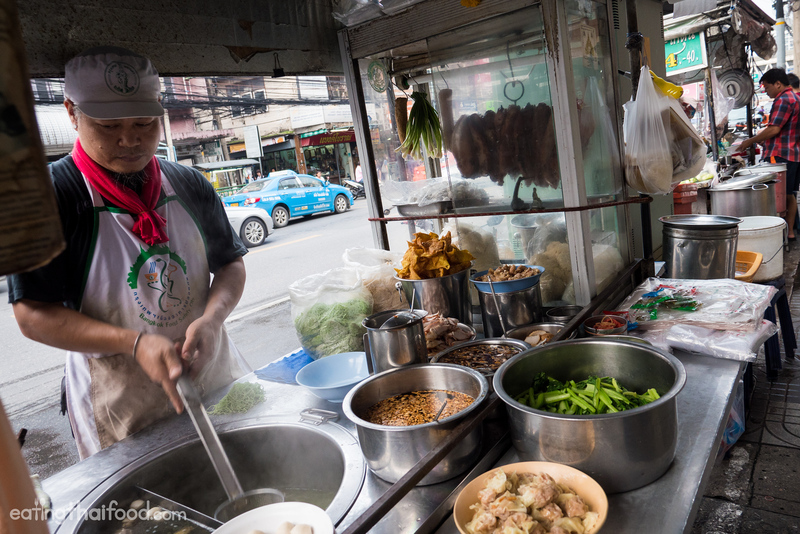 Uan Bamee Giew (อ้วน บะหมี่เกี๊ยว (กวางตุ้ง) is a Bangkok street food stall located at Saphan Kwai that serves excellent egg noodles and won ton dumplings. The freshly made and cooked egg noodles, and the dumpling, were the highlight of eating here, and all the other toppings were just an extra delicious bonus. Lately I’ve been really loving egg noodles, and this is another place in Bangkok to add to the most delicious list. 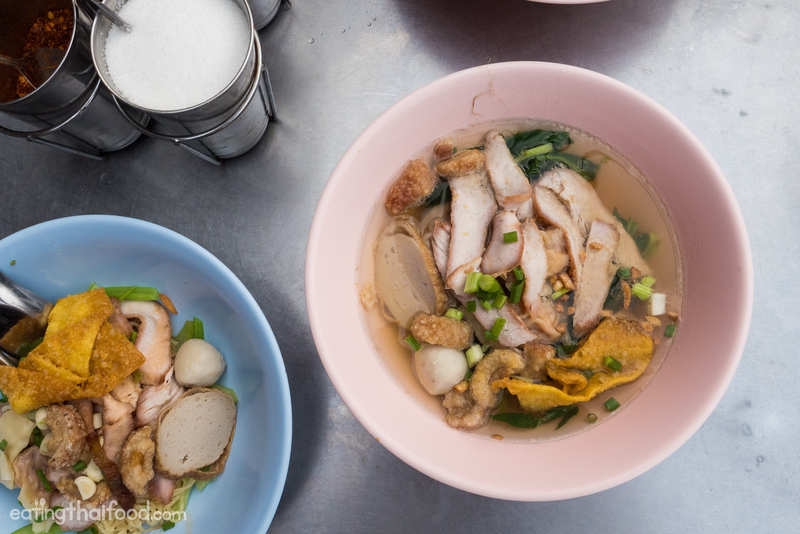 If you’re in the Saphan Kwai area, Uan Bamee Giew (อ้วน บะหมี่เกี๊ยว (กวางตุ้ง) is an fantastic place for a quick bowl of egg noodles. เปิดบริการทุกวัน 17.00 – 23.00 น. 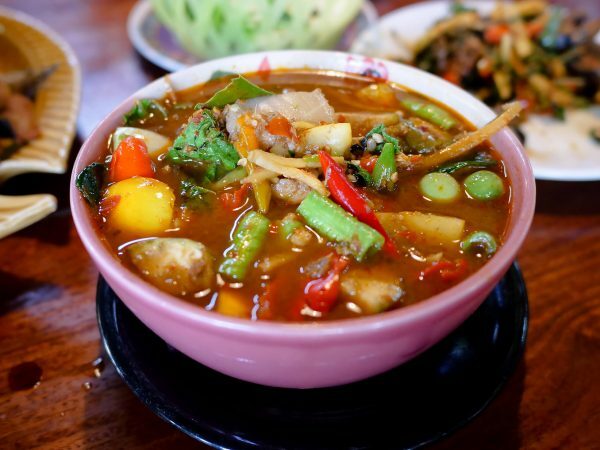 How to get there: Uan Bamee Giew (อ้วน บะหมี่เกี๊ยว (กวางตุ้ง) is located on Thanon Pradipat. 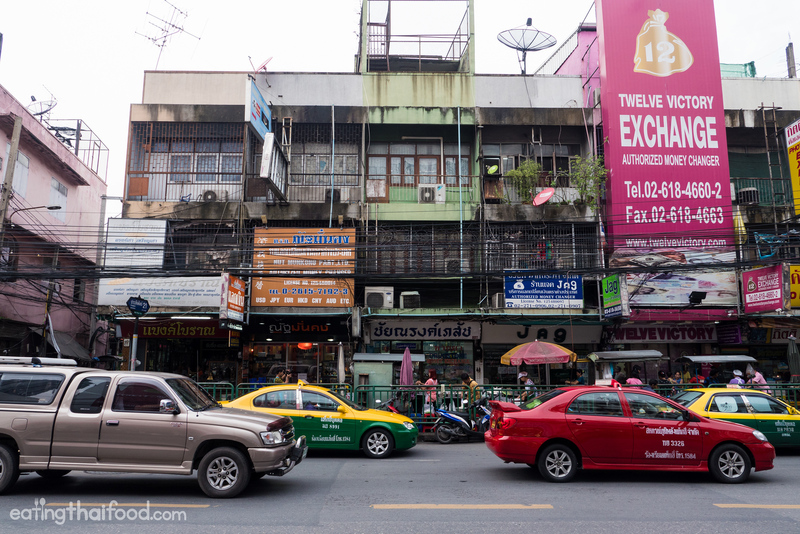 You can take the BTS to Saphan Kwai station, Exit #1, walk to Pradipat, cross to the opposite side and make a right, and the stall is just after Soi 20. A few of us hunted down this stall and I must say it’s a good recommendation! Simple good quality noodle, freshly made with care. Comfort food we can eat everyday. We especially liked that delicious soup served with that big piece of bone. Two thumbs up! Thank you very much for your amazing website. It helped me a lot in Bangkok! Hey! you have to try “ba mee kai” ekkamai on ekkamai 19. hands down the best egg noodles in the whole city. Hey Val, I haven’t tried it, thank you for sharing. When I’m in that area I’ll try to get there, thanks! 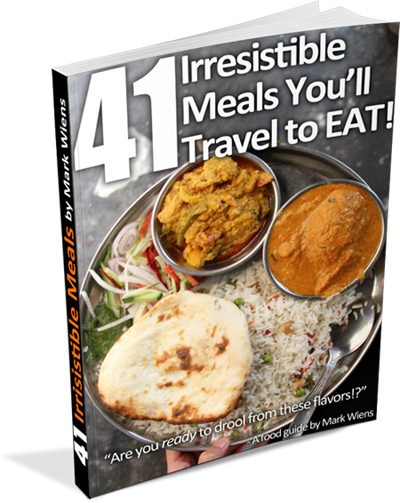 Hi Mark, Thank you so much for awwwesome grill chicken. Definitely thumb up!!! You’re welcome Nui, glad you enjoyed it! Hello Marks. Great blog & video as always. I really enjoyed it! Just so you know. 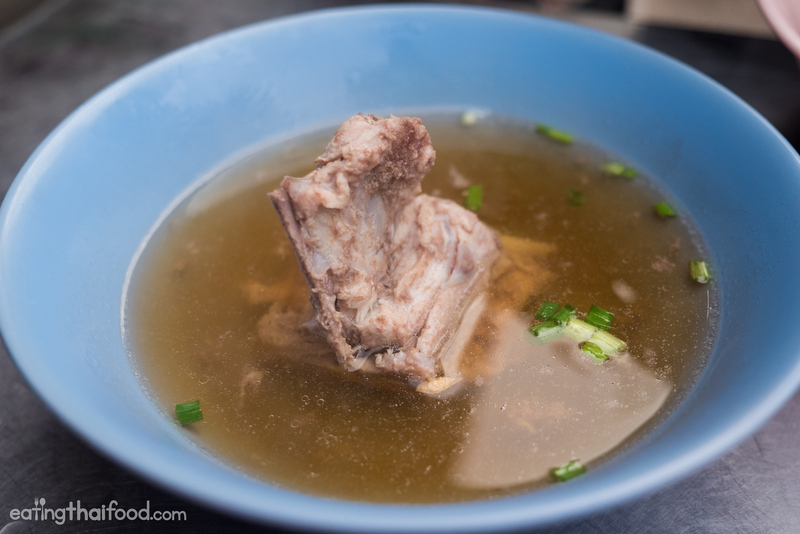 ‘kwangtoong’ in ‘(อ้วน บะหมี่เกี๊ยว (กวางตุ้ง)’ is actually refer to Guangdong or Kwangtung province in China. So the stall’s name shows that they sell Kwangtung style(or chinese style) noodle. Hey, you’re welcome, thank you for reading. Wow, ok that makes much more sense, I totally made a mistake about that. Thank you for the correction and information, really appreciate it! I’ll get that changed.